A weekly newspaper produced a special edition to mark the first anniversary of a car crash which killed a band from its patch. 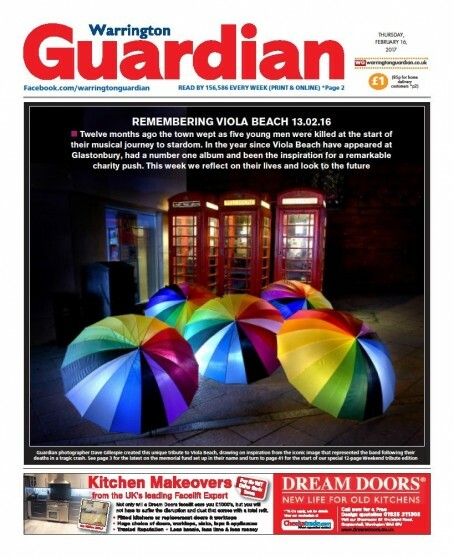 The Warrington Guardian has remembered Viola Beach, whose members River Reeves, Kris Leonard, Tomas Lowe and Jack Dakin died along with their manager Craig Tarry when the car they were travelling in plunged from a bridge in Sweden on 13 February last year. To commemorate the date, Guardian photographer Dave Gillespie recreated a previous picture of the band in front of Warrington’s red phone boxes – substituting the now-departed musicians with five rainbow umbrellas, an image which was synonymous with them during their career. The original picture of the band taken by Georgia Park was shared across the country following their deaths last year. A pull-out Weekend supplement of previously unseen photographs, as well as new interviews with their families and those closest to them, was also included in the edition. The Guardian first broke the news of the tragedy on its website the morning after it happened, and launched a successful campaign which saw the band’s single ‘Swings and Waterslides’ posthumously enter the charts at number 11 the following week – when the four-piece had been due to visit the newspaper’s office to be photographed for a special supplement ahead of an upcoming hometown gig. 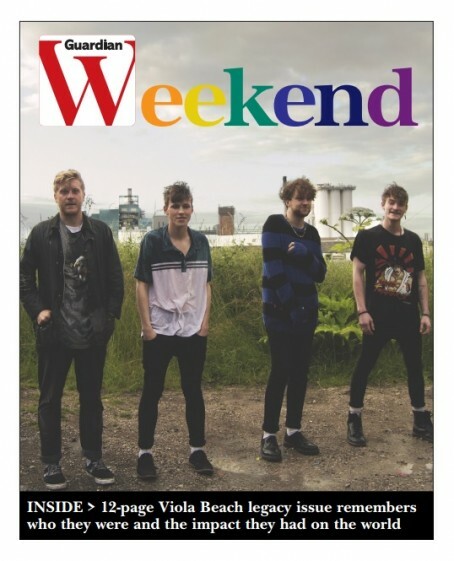 David Morgan, who edits the Weekend supplement, said: “We have been following Viola Beach’s story both before and after their tragic deaths, and what has been heartening is that the families have said the way Warrington people have rallied round them has given them strength. “We hope this edition brings fresh perspective on the band’s accomplishments as we all come to terms with what was truly a tragedy in every sense.